You don’t have to sacrifice satisfying your sweet tooth when you are eating healthy, or trying to lose weight. The trick is to find healthy recipes that are sweetened with natural sweetener like honey. Limiting white sugar is one of the best things you can do for your health and happiness. Toss together the chopped apples, orange juice, cinnamon, and honey. Mix until the apples are fully coated. Spread the apples into an 8-12” baking dish. Melt the coconut oil in the microwave. This should only take 30 seconds. While the oil is melting, spread the granola on top of the apples. 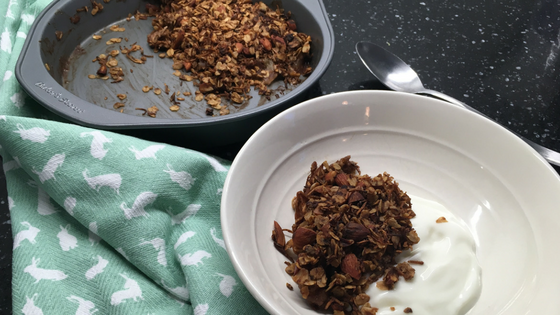 Drizzle the oil evenly on top of the granola. 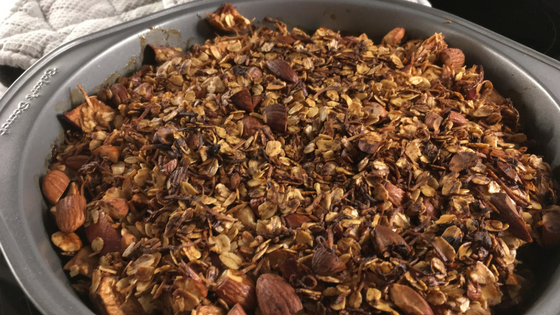 This will prevent the granola from burning and provide nice crunchy clusters once it has cooled. Place in the oven and bake for 30-40 minutes. Let cool and serve on top of plain yogurt for a healthy dessert.